You won’t know or truly appriciate who this man is until you watch the original video after the break. 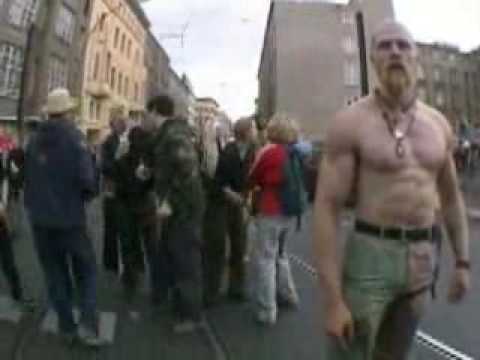 But to give you a little background, The Techno Viking is a tall, muscular, charismatic, intimidating, German man that danced for the camera in a techno street-parade called Fuckparade,in the year 2000 Berlin, Germany. After an innocent raving blue haired girl was disrupted by some unruly dude, The Techno Viking has come to her rescue and managed to restore peace and love in the Fuckparade, as this is all documented by the “Kneecam” recording at the parade. I tried to submit a comment earlier, although it has not shown up. I like your writing style. This post has some really wonderful insights and interpretations in it. I don’t think I could have put it better myself.